MANY SINGERS and musicians claim that music paves the way to peace. When people sing together or make music together, they tend to harmonize rather than antagonize, and their differences are cast aside. A prime example of this can be seen in the Galilee Orchestra founded in 1995 by composer Nabil Azzam, who was the first Arab student at the Rubin Academy of Music, and who subsequently went on to receive degrees in musicology and ethnomusicology from Tel Aviv University, the Hebrew University and UCLA. Jews and Arabs play together in the Galilee Orchestra, and last Saturday night they performed at a concert hosted by industrialist Stef Wertheimer at his Nazareth Industrial Park, in cooperation with the Polyphony Foundation, the Orpheus Group and the Nazareth Tourist Information Center. Among the guests were head of the European Union Delegation Lars Faaborg-Andersen and his wife, Jean Murphy; Nabeel Abboud-Ashkar, head of the Polyphony Foundation and Conservatory; and some 370 other invitees. In welcoming the guests Wertheimer said that inasmuch as he loves culture, everyone present should be aware that they were sitting in an industrial park whose main purpose is to provide work for the people of Nazareth and other parts of the Galilee and the Jezreel Valley, who can come here to create and produce, and with their earnings can enjoy cultural experiences such as the cinema and stage productions. The Lie: "Continuing the settlement project is proof that Israel does not want peace." The Truth: The settlements are at the center of a heated debate within the Israeli public. The criticism against it, one has to stress, is not part of the demonization. But the peace proposals make it clear that the settlements are not an obstacle for peace. Israel has evacuated thousands of settlers from the Gaza Strip. In any future agreement, there will be settlers living in settlement blocks on 5% of the area. The agreements regarding the minority of settlers outside those blocks, is subject to negotiations between the parties. Maybe they will stay where they are. Just as there is an Arab minority in Israel, there could be a Jewish minority in the Palestinian State. Or perhaps a different arrangement will be found. The Lie: "Israel is committing Palestinian genocide." The Truth: Eleven to 12,000 Palestinians have been killed between 1967 and 2015. The vast majority were involved in hostile activities. Relative to the size of the population this number is smaller than the average death rate from road accidents. One can call it many things – but not genocide. It does not even come close to being genocide. This is one of the most blatant lies behind anti-Israeli propaganda. Contrary to terrorist organizations, who intentionally target civilians (both with rockets and with suicide-attacks in densely populated centers); Israel makes every effort not to harm innocent civilians. The Lie: "Israel is the number-one enemy of Muslims and the source of all conflicts in the Middle East." The Truth: Israel is not the enemy of the Arab World, and has diplomatic relations, including peace agreements, with countries with large Muslim populations. The number-one enemy of the Muslims is world Jihad that kills mostly Muslims – in Nigeria, Somalia, Afghanistan, Yemen, Iraq, Libya and Syria. Israel has nothing to do with this blood fest. Many Muslims admit that their main problem is the Jihad, which murders – in terrorist acts only – about 2500 Muslims every month. In 2014, for example, more than 32 thousand people died in terror acts executed by the Jihad, with all its branches. This does not and did not have anything to do with Israel. The Lie: "Only an academic and consumer boycott of Israel will improve the situation of the Palestinians and bring peace." The truth: Objective data proves that the Palestinians’ situation has improved under Israeli rule. For example, in 1967 there was not even one academic institute in the West Bank or the Gaza Strip. Since Israeli rule, and under its patronage, scores of institutions of higher-education have been established. 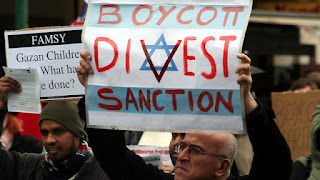 The will of Palestinians for peace has to be respected, but one should realize that the main demand of the boycott movement is not “put an end to occupation”, and not even “two lands for two peoples’’’ but rather “the right of return” i.e. the annihilation of the State of Israel. The heads of the Boycott Movement ‘the likes of Omar Bargouti and Ali Abuneima’ make it absolutely clear, that this is their intention. This is what makes the boycott the number-one enemy of any peace settlement based on two-lands-for-two peoples. The boycott only nurtures the illusion, and in doing so – perpetuates the conflict. The Lie: "Israel harms the Palestinians in every Humanitarian aspect. What the Nazis did with gas chambers Israel does by raising mortality rates among babies." The Truth: The World Bank, the World Health Organization, and even Palestinian investigators have presented data which clearly shows that these allegations are no more than a pack of lies. Life expectancy among Palestinians in 1967 was 48.6. It has risen to 75. The Lie: The definition of Israel as a "Jewish state" is an expression of racism. The Truth: The most important principle in the U.N. Charter is the right to self-determination. Jews who want autonomy, as well as Palestinians, have that right. Jews have fought for the right to self-determination because they suffered persecution. Czechoslovakia was divided into two nation states; Yugoslavia was split into six entities, because each people claimed their right to self-determination. An effort to deny any people this right is a violation of International law, and in itself is an expression of racism. It must be said, that as a Jewish Democratic country, non-Jews have full and equal rights in Israel. The devious activities of the organisation "Breaking the Silence" (BTS) has finally resulted in a backlash. BTS operates with finance from foreign governments trying to undermine the sovereignty of a democratic state. It has never come out with claims that can be proven. Their claims are always anonymous and and based on hearsay not fact. Now the #MyTruth’ Movement Grows Among IDF and is coming out with facts and sources to counter ther BTS claims. Following is one letter from an IDF serving soldier. I am writing this in English because I want everyone to understand, not just the Israelis. Dear Breaking the Silence, I too served as an infantryman in the West Bank, Lebanon, and the disengagement from Gaza. I too served in a unit that was probably the most left-leaning company in the army at the time until I finished my operational training. I have continued to serve Israel in various capacities, abroad and here in Israel, since my discharge in 2007. I have read your various posts and “testimonies”. Why did you wait years to tell stories to audiences abroad? Stories that include a lot of hearsay, jumping to conclusions, a lack of knowledge about the incidents in question. The stories you tell seem to have little basis in the reality that I remember. I remember being told in every briefing that all civilians were to be treated with respect, that in case of a firefight we were to avoid returning fire if there were civvies in the area. I remember going into Lebanon and running out of food and being told that we were not allowed to touch the food stores in the houses we were in, that rule only being broken after realizing that we physically wouldn't make it back to Israel on foot on a starvation diet (I lost between 10-15 lbs/ 4-8 kg that week). I remember officers telling soldiers not to sleep on the beds and mattresses or damage anything unnecessarily, this in houses with tank shell holes in them. I remember the civilians that we would give food to in Hebron until we realized that they were carrying out recon on us and that their brothers would throw rocks at us after they would leave. Why do you protest against soldiers (your own brothers-in-arms) who carry out missions in extremely complex areas of operations which are 100 percent legal according to international law? There is nothing “Nazi-like” about conducting routine checks at checkpoints for explosives and/or weapons, nor is there anything wrong about setting up mobile checkposts in known “hot areas”. There is certainly nothing wrong about arresting members of terror cells in the middle of the night. These are all things that are/ would be done by any sensible military force that would find itself in the same situation. You are not an organization that wants the IDF to be an ethical force. If you were, you would work with the chain of command in order to find those who do not act according to the ethics and commands of the IDF and punish them, all without garnering media attention and demonizing the entire army. You are an organization whose sole purpose is the demonization of Israel in the US and Europe. I can have respect for those who disagree with me but not for those who undermine democracy by running to other countries and telling exaggerated stories about us in order to feed their conscience for something they may have done or witnessed when they were young and no moral backbone. Now I too have Broken my Silence. A new poll conducted by the Palestinian Center for Policy and Survey Research showed that two-thirds of Palestinians support the stabbing attacks, and that a growing majority supports an armed intifada and rejects the two state solution. Furthermore, if presidential elections were held today in the West Bank, Hamas would win against President Mahmoud Abbas. The three parties examined regional and international issues in the Middle East and Eastern Mediterranean in view of the importance that they attribute to their enhanced bilateral ties and the desire to formalize a trilateral regional partnership as a promoter of regional stability, security and cooperation. They also discussed the trilateral cooperation in a wide range of issues including search and rescue, civil protection, economic cooperation, shipping, health and medicine, education, agriculture and fisheries, conflict resolution, people-to-people contacts and culture. The discussions reflected the common will to enhance even further the partnership between Israel, Greece, and Cyprus in all fields. Secretary General Ambassador Paraskevopoulos from Greece, from his part, stressed the need to comprehensively address the crucial issue of current refugee flows from crisis regions and their humanitarian, social and financial implications, as well as their root causes. Permanent Secretary Ambassador Zenon, Cyrus briefed his counterparts on the negotiations process under the United Nations auspices aiming at a just, lasting and comprehensive settlement of the Cyprus Problem, based on international law and the relevant UN Security Council Resolutions. The following story from a Canadian volunteer shows the true face of Israel that is hardly ever reported in the national media. 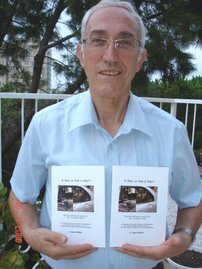 "This spring, I returned to Israel and joined a six-week Ulpan program at Ben Gurion University to learn Hebrew. I ended up extending my Israel experience into the summer by tacking on another short stint with Sar-El followed by three months at ALEH Negev, the crown jewel of Israel’s largest network of facilities for children with severe physical and cognitive disabilities. At ALEH, I utilized physical therapy techniques to advance the children I worked with toward independent mobility, a very rewarding task. Surrounded by angels in the Promised Land, I learned the true meaning of inclusion, altruism and humanity." · Instead of educating our children, as they do in the West, to be part of the Startup Generation, we follow the lead of darkest Africa, where children are armed with assault rifles and sent out to kill other children. 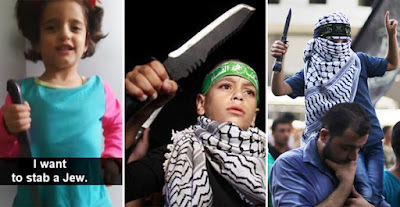 · If the Palestinians really want to pick a fight with Israel, why do they send children to fight a "holy war" instead of fighting it themselves, like men? · The only difference is that the members of ISIS go out themselves to kill; the Palestinians send their young. Why are these not "war crimes"? · We sacrifice our sons and daughters in the name of Allah, as though Allah were a pagan statue with an altar and had to be appeased with the blood of children. · Here, the Islamists want to "liberate" Jerusalem from the infidel Zionist-Crusader occupation. Next, they want to "liberate" occupied Spain, once Muslim Andalusia, and return it to the bosom of Islam. After that, they want to occupy the Vatican and establish the Islamic Emirate on the ruins of Christianity.